Our beautiful river system, with its continually improving water quality, provides an excellent habitat for a wide range of fish. The Tyne is now the best salmon river in England and Wales – a spectacular recovery from the polluted river it once was. Three of the Tyne’s major tributaries are regulated by reservoirs, the Derwent, the Rede and the North Tyne. Kielder Reservoir, at the head of the North Tyne, has a major impact on river flow and releases from the reservoir make the river more fishable. Before fishing, it is worth checking when releases are planned. The Tyne is the best river system for salmon and sea trout in England and Wales and is even starting to challenge some of the more famous Scottish rivers. The quality as well as the quantity of fish is superb; the season begins in February, with beautiful fish often caught on the opening day. Spring fish are gradually increasing in numbers with typically April/May being the best months. The best early season fishing up to May is on the main Tyne. Thereafter, the number of fish entering the river substantially increases. From June, the whole system produces steadily, with catches gradually increasing through July and August, and peaking in September and October. The Tyne’s rivers also have a healthy wild brown trout population, particularly on the river Derwent where quality grayling also feature in many returns. There is a great tradition of coarse fishing on the river Tyne. This includes some very good quality dace and sizeable chub, as well as roach and gudgeon. Most coarse fishing is concentrated on the main river and managed through local angling clubs. By their nature, tidal estuaries support very rich and diverse marine ecosystems. Worms, crabs, shrimps and fry offer abundant food for species including mackerel, cod and flounder. There are an enormous number of different species and therefore methods of fishing, which combined with the 19 mile length of the tidal stretch, gives tidal fishing a universal appeal. The Tyne Angling Passport offers a day’s fishing on a range of ‘wild’ beats across the Tyne catchment for only £8 per day. All proceeds come back to the Trust and we then use the money to further improve the river. The beats primarily offer wild Brown Trout fishing but anglers can enjoy good fishing for Grayling on the river Derwent and for the occasional Salmon and Sea Trout on the Devil’s Water and the river Rede. We’re grateful to the goodwill of the beat owners who by donating use of the beats, help to keep fishing accessible and affordable. 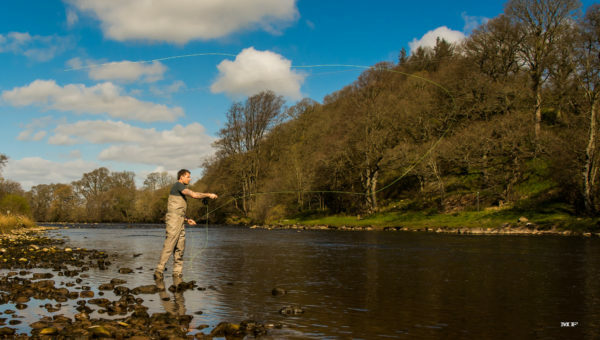 In buying a day ticket through the Tyne Angling Passport you not only get a good day’s fishing, but you also support Tyne Rivers Trust in conserving rivers across our magnificent catchment. Use the interactive map underneath to locate the beats and make a booking through our shop. For further information on beats or advice please contact our Fisheries Manager Aidan Pollard. You can book fishing on most of the commercial game fishing beats on the Tyne through FishTyne. The FishTyne website also contains useful information on how the river is fishing, recent catches etc. The Tyne is home to the native white-clawed crayfish. Please don’t bring signal crayfish, or other nasties, to our lovely rivers! Please follow the check, clean, dry advice for all your fishing kit. See our invasives page for more information about the threats to our rivers. The law requires any angler over the age of 12 to carry an Environment Agency Rod Licence and have permission to fish from the owners of the beat. Rod licences are easily obtained online from the Environment Agency or at the Post Office. Some beats will have their own fishery rules in addition to the byelaws below, please check before fishing. National and Regional Fisheries byelaws for the North East. Click here to buy your licence from the Post Office. You can help monitor changes in the Tyne’s fishery by taking part in the Environment Agency’s logbook scheme. Record where, when and for how long you fished along with river/weather conditions and what you caught. This information is a very useful indicator of the overall long-term trends of the productivity of the river.